Costa DoradaSalou - 4 Star. This Hotel is sure to prove popular with holidaymakers who are looking for a good standard of accommodation, in a convenient location with plenty to keep them entertained both on site and in the local area. The Sol Costa Daurada Hotel is located in the city of Salou, just 900 metres from one of the most beautiful beaches of the Costa Dorada and close to the famous theme park Universal Studios Port Aventura. 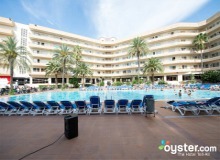 The Olympus Palace Hotel is situated in the tourist centre of Salou, 200 meters from the beach and only 1km away from The Port Aventura theme park which will delight the young and old. This hotel sits in the popular beach resort of Salou in Costa Dorada, just 800 metres from the Playa Capellans Beach. Salou is well known for its lively atmosphere, excellent resort amenities and entertainment for the whole family. The Port Aventura Hotel recreates a Mediterranean village surrounded by lush vegetation and two amazing lagoon pools and with direct access to the PortAventura theme park this is the ideal combination for theme park lovers of all ages. PortAventura World is set in the heart of the Costa Dorada, very near to Barcelona. The area enjoys an enviable, sunny climate all year round. The extensive range of culinary, leisure, cultural and sports activities offered in the area make this an unbeatable holiday resort. Blaumar Hotel is located in Salou close to various tourist attractions such as the sandy beaches (Platja Llevant, Platja Ponent etc) and the Port Aventura water park. The offers plenty of relaxing facilities such as Spa and Fitness Zone (Jacuzzi, Sauna, Turkish bath), swimming pools, restaurants and much more. 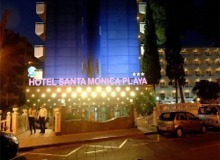 The attractive 3-star Santa Monica is located in the heart of Salou and is just 1.6km away from Paseo Maritimo, Municipal Theatre Auditorium, Port Aventura and many more attractions. Jamie I is a hotel located in Salou which is the main tourist destination on Costa Dorado that is surrounded by sandy beaches. 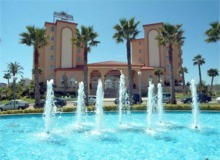 The hotel offers plenty of facilities for guests of all ages to enjoy. A recently renovated hotel consisting of two large buildings situated in the commercial and entertainment area of Salou. 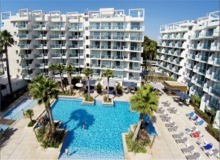 Located just a short walk from Llevant beach in the commercial and entertainment region of Salou. 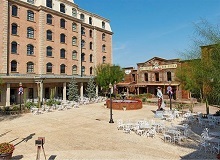 Popular theme park PortAventura is also just a few minutes walk away. Costa DoradaComaruga - 4 Star. Sea front hotel with a privileged situation in the quiet resort of Coma-Ruga. Ideally suited for a relaxing family holiday. Gran Hotel La Hacienda is a warm and inviting hotel situated in La Pineda Beach that contains 260 rooms. The hotel has plenty of facilities solarium, facilities for disabled people, swimming pool for children and adults, outdoor Jacuzzi, sauna, tennis and many more.